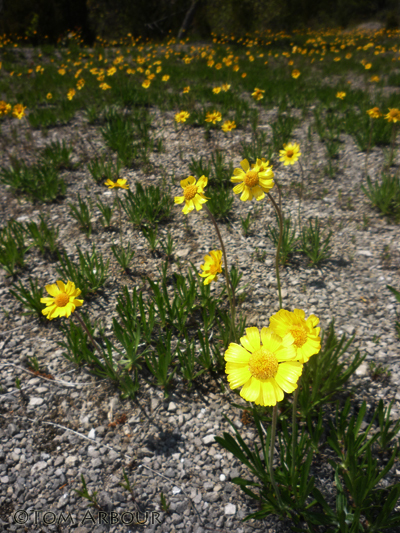 Have you seen Ohio's rarest wildflower? The Lakeside Daisy, Tetraneuris herbacea, a federally threatened species that we have right here in Ohio, has occupied quite a bit of my time lately. I'm part of a team that is censusing this rare wildflowers population in abandoned and active quarries in Marblehead, Ohio. I'll be heading up north early tomorrow morning once again. It is quite a plant, and if you can make it to Lakeside Daisy State Nature Preserve this weekend, it should still be blooming. For more about endangered species day, visit the National Wildlife Federation. Are any nurseries allowed to grow and sell these. When it comes to native plants I would hope they are permitted to grow them. I had not even heard of them until today. I am truly not up on the wildflowers...this is reminiscent of what we called Buttercups as a child. A very pretty flower. Abe- Good question, I'm not sure. I have never seen this species in propagation. They grow on the floors of extremely dry, rocky, abandoned quarries. Where they are cultivated, at places like the Governor's Heritage Garden, they are literally grown in limestone gravel. Hi Spooky- Yes, it does look a little bit like a butter cup, especially because of its yellow flowers. This species is in the composite family, and is more closely related to sunflowers and daisies. What a beautiful flower! Marblehead itself has so many wonders to see, now I will look for one more. We visit the Lake Erie islands a few times every summer and love to see the sights. Does anyone know if this species also lives at the quarry on Pelee island? Very pretty! Three cheers for Marblehead having some! It's a lovely part of Ohio along the lake there. Kylee- Thousands of seeds are produced, and they are fertile. To grow them in a garden, you literally have to have them in marly, limestone gravel soil. Ellen- That is a great question. It does not grow on Pelee, but it has been introduced to the quarries on Kelleys Island. Mary- It is a great region, it has been mucked up a little bit by humans, but there still are some very interesting natural areas around.